Manchester - Pep Guardiola would consider taking his Manchester City players off the field in protest if any of his stars were the victims of racist abuse. Guardiola said society's ills are to blame, but warned against the concerning rise of racist incidents at football games, including in England. "I think in Europe it is, not in football, getting worse," said Guardiola when asked about the issue. "I am a human being and it's not nice. Asked if City would walk off, Guardiola said: "We could do that, yeah." But, he added, "I'm not alone in the club, or part of the club. I would have to involve the club, the chairmen and CEOs and my captain and the team and the players, if we all together decide we can signal to do it, why not? "The situation changes when you do something, if not it's impossible and the situation is always the same," said Guardiola. "That is why when people like him (Sterling) or other cases express what they express it's good for our future, for our society to do it. "The problem is not about the football itself, it's the society, what is happening in Europe? The extreme right side is going there and the message they are sending to win elections, to win votes, we are not safe. 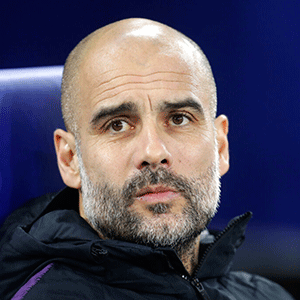 Guardiola was talking before City's return to action in the Premier League, following the international break, with a visit to struggling Fulham. With his club still active in three competitions - and on course for an unprecedented quadruple of trophies - the City manager will welcome back Kevin De Bruyne, Fernandinho and Vincent Kompany from recent injury lay-offs. "Yes, of course he needs time," said Guardiola. "He trained the last three days and the reaction in his knee is really good."